Michael Bettine, a master gong musician, was the first performer I heard at MOFO last weekend. 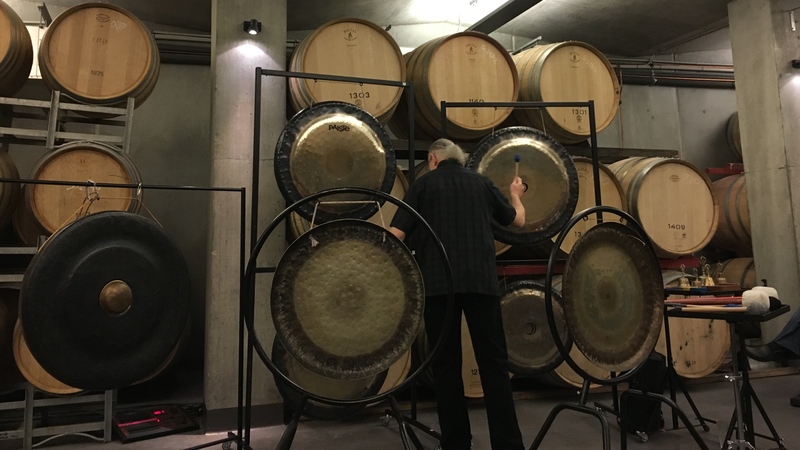 The sounds he was able to create, using metal and its interaction with air, were captivating. Metal is described as an element in two widely known frameworks, the periodic table and in western accounts of Wu Xing, the philosophy of five agents or phases that permeates Chinese thought and action (for example Chinese horoscopes, Chinese medicine, Feng Shui). In both cases metal does not fit neatly into the commonly held western perception of elements as natural forces like earth, air, water and fire. The deeper you search, the clearer the elemental role of metal becomes. The connections between metal and the elements are many and varied. It is considered an element in its own right, metals can represent elemental forces, making things out of metal is an elemental process, metal changes its form when exposed to the elements and musicians make magical music when metal interacts with air. Most of the chemical elements in the periodic table are metals. Gold, silver and copper in their ‘native’ form were the first metals transformed into objects for human use and appreciation. Meteoric iron, an element that fell from the sky, was also used by cultures such as the Aztecs who used it to make knives. Copper usage (in its unalloyed state) for tools, weapons and decorative items dates back thousands of years across diverse cultures. Native North Americans around Lake Superior identified copper with the sun, the ultimate expression of energy. For the Inkas, gold was a symbol of the sun and was highly valued. Silver, and the moon it represented, surpassed gold in the eyes of the Chimu who pre-dated the Inka. These cultures exemplify the connections made between native metals and elemental forces such as the sun and moon. Gold has been celebrated as a product or representation of the sun, the ultimate source of energy, by many cultures. 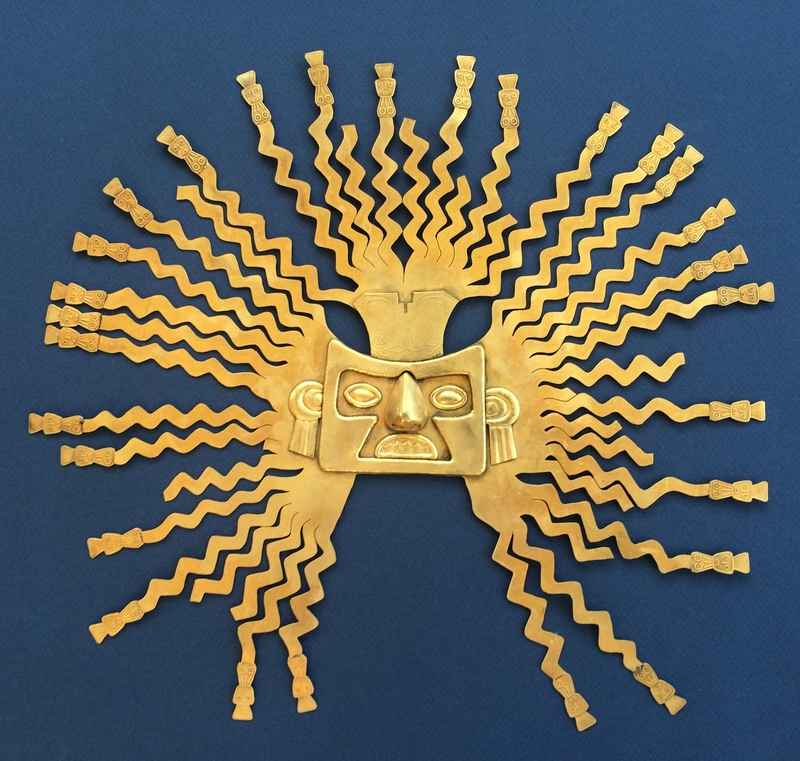 This golden sun mask, from the La Tolita culture in northern Ecuador, is around 2,000 years old. The original is in the Museo de Banco in Quito, Ecuador. 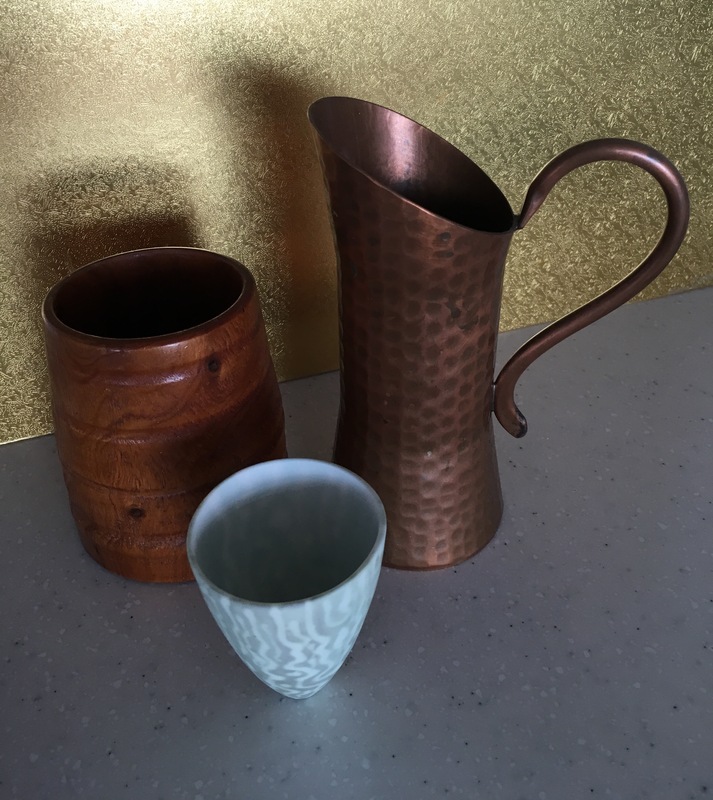 Copper has been used in its native and alloy form to create objects for human use for at least 8,000 years. This copper jug was crafted around the 1970s by Weeda in Ulverstone, Tasmania. It sits well with the wood and ceramic objects, both elemental in themselves. Gold and silver are the archetypal metals in Wu Xing, the Chinese philosophy of the “five phases” or “five processes”. 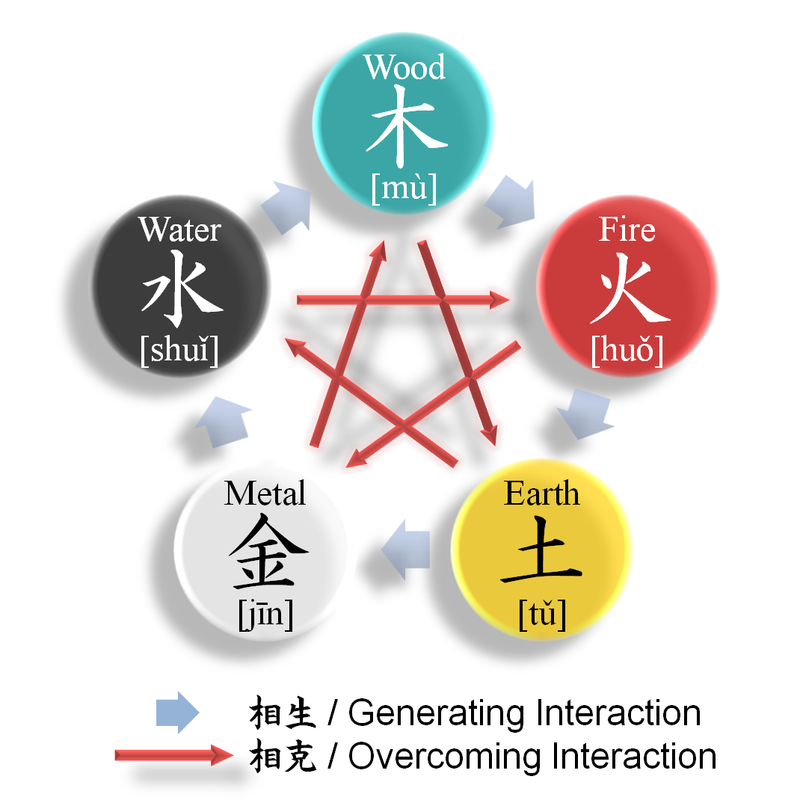 Most western descriptions describe the five phases of Wu Xing (metal, earth, water, fire and wood) as elements. This term is commonly used in English publications on Chinese medicine, Feng Shui, Chinese astrology and more. Specialists in Chinese philosophy explain that this translation is inaccurate and should not be used, at least not in all circumstances. My sense is that the use of the word element is here to stay in this context. Many western publications that refer to Wu Xing use the term ‘elements’ to describe the five phases of earth, fire, water, wood and metal that underpin much of Chinese thought. The five phases in Wu Xing have been described as the five materials considered necessary for life or the five ways in which energy expresses itself in the natural world. This makes me feel at ease about them being called elements. As long as there is an understanding of the cyclic and interactive nature of Wu Xing and that the elements or processes aren’t fixed. Another important aspect is that metal, and the other four elements in this framework, have many associations – with colours, seasons, directions, animals, planets, health, personality types and more. This image of Wu Xing illustrates the cyclic and interactive nature of Wu Xing. In the generating cycle Earth engenders Metal and Metal creates Water. In the overcoming interaction Fire overcomes Metal and Metal overcomes Wood. If you Google Wu Xing images you will see many use the word ‘element’ to describe the five components. Source: Wikipedia. 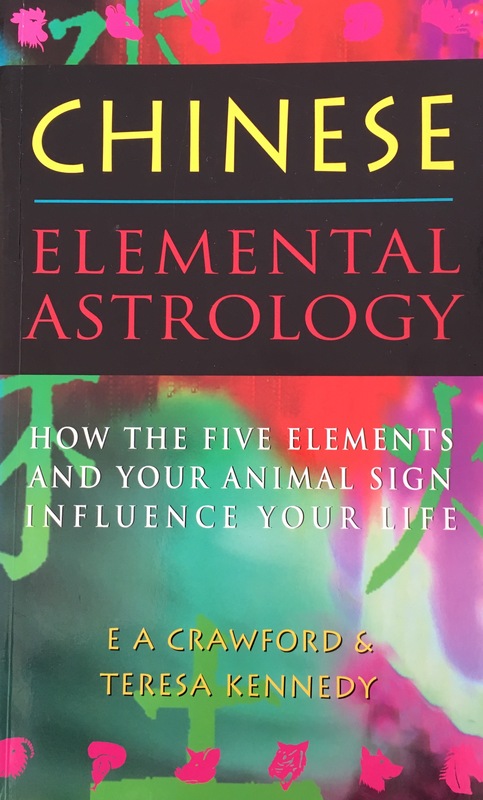 Chinese astrology provides a timely example of these associations. We are entering the year of the Red Fire Monkey. In Chinese astrology the Monkey is associated with the fixed element of Metal. A person’s characteristics are said to be determined both by the fixed element of their zodiac sign and the element of the 12-year cycle they were born. So anyone turning 60 in 2016 will have characteristics of both Metal and Fire. Metal attributes are considered to be firmness, rigidity, persistence, strength, and determination in Taoist thought. Alchemists provide a different perspective on metal and the elements. In alchemy, metals represent combinations of the qualities that make up the elements of earth, air, fire and water. One of the aims of alchemy is to transmute base metals such as lead into precious ones such as gold and silver. The Philosopher’s Stone, for many a symbol that represents the final outcome of man’s inner transformation, is the tool/substance that facilitates the process. My light-bulb moment about the elemental nature of hand-making objects out of metal came after watching a video on the traditional art of Japanese sword-making. The importance of earth (iron sand and clay), air (the bellows), fire (the forge), and water (used for quenching the steel) in the creation of the sword was striking. It was only later that I discovered the words of Alan Coleman, a sword maker based in Oregon, describing the elemental nature of the process. He describes the practice of being a swordsmith as one where all of the elements are bought together by the human element to create an object of beauty, and terror (when used historically by the Samurai). 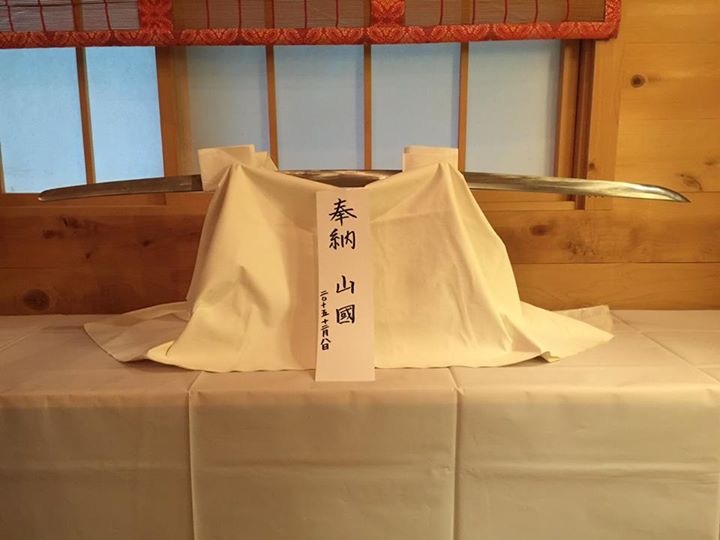 This Japanese sword was a recent gift from Alan Coleman (Yama Kuni) to the Shinto Tsubaki America Grand Shrine near Granite Falls, Washington State. Adam believes that the practice of being a swordsmith is a Shinto practice in it’s own right due to the very elemental nature of the process. Source: Tsubaki America Grand Shrine. Blacksmiths have a broader remit than swordsmiths. They make and repair many things, such as complex weapons and armor, gates, grills, agricultural implements and nails. These objects are created out of wrought iron or steel by forging the metal, using tools to hammer, bend and cut. Implicitly, earth, air, fire, water and the human spirit are fundamental to the blacksmith trade. Shaun Williams, a blacksmith from Florida USA, created this flower using the elements of earth, air, fire and water. Each work hand-crafted out of metal, whether utilitarian or decorative, also draws on the spirit of the maker. Source: Shaun Williams. Blacksmiths have been held in high esteem through much of history. Vulcan, the Roman god of fire, was patron of blacksmiths and workers in metals. According to sacred-texts.com, in the Middle Ages blacksmiths were looked upon as superior to other artisans, owing to their faculty of seemingly toying with fire, rendering the dangerous element subservient to their will, and by its aid manipulating iron with ease and dexterity. Blacksmithing went into decline following the industrial revolution and largely became associated with shoeing horses. In the last few decades it has seen a revival and new communities have formed to create objects of utility and beauty. Being a ‘woman of fire‘, my favourite is the ‘Sisters of Fire’ – a group of women who love fire, blacksmithing and welding. 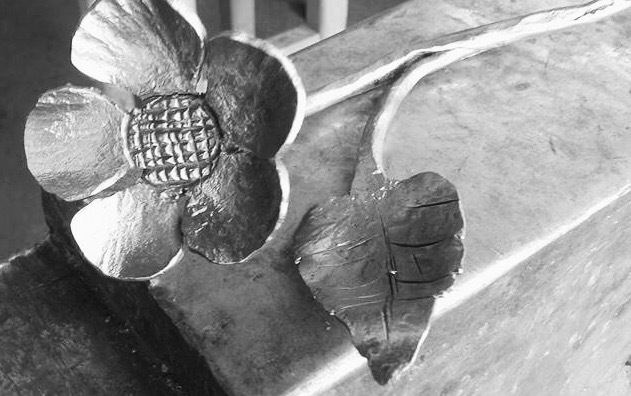 Metal is also used as a material by jewellers such as Thomas Mann and sculptors like Wim Delvoye to great effect. Wim has two outdoor sculptures at MONA (where MOFO is held) made out of steel. With exposure to the elements, the rusting metal is a sight to behold. Given enough time the sculptures will corrode entirely to rust and disintegrate, a potent symbol of the dynamic nature of the elements. 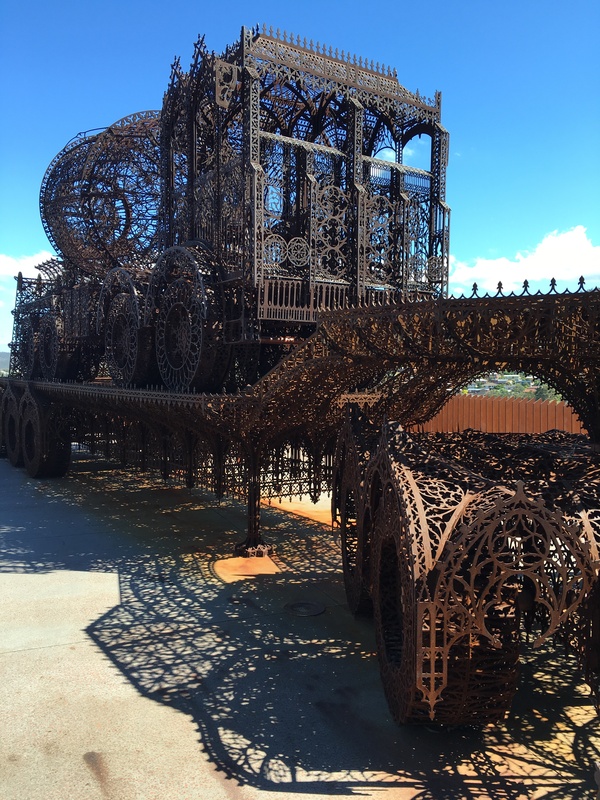 The interaction between metal, water and air in this sculpture by Wim Delvoye at MONA creates a beautiful layer of rust. Given enough time, these interactions will lead to the sculpture corroding to rust dust. We now return to where we started. The connections between metal, music and the elements. Musical instruments made out of metal interact with air to create amazing vibrations. 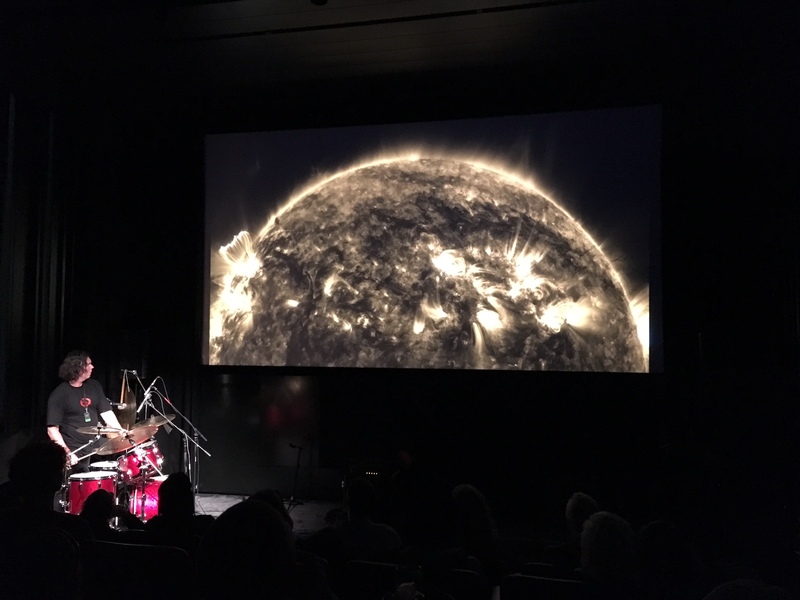 Konrad Park, one of the performers at MOFO, used a drum and several cymbals to play improvised music to images of the sun. As he held the microphone to the vibrating cymbal, inspired by images of solar flares, the elemental power of metal shone through. The enchanting organ recital by Christopher Wrench also demonstrated the subtle and beautiful interactions that can arise between metal, air and the human spirit. It was a joy to behold. Konrad Park at MOFO, creating improvised music in response to images of the sun. At one stage Konrad carried a cymbal around the room while playing it. The vibrations travelled through your body, a truly elemental experience. Nine days after writing this post I found this glass dish at a second hand shop. Talk about serendipity. 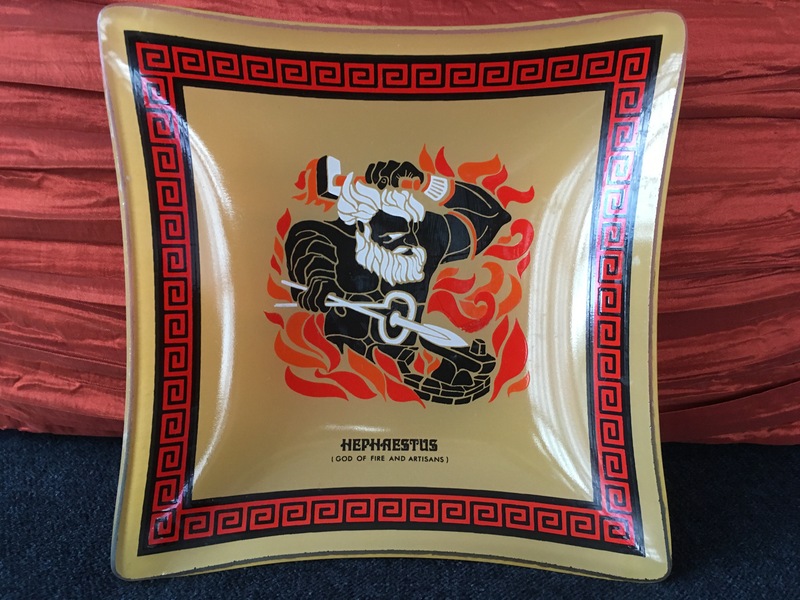 Hephaestus, the Greek equivalent to Vulcan, is the god of blacksmiths, craftsmen, artisans, sculptors, metals, metallurgy, fire and volcanoes! He must have felt left out. This entry was posted in Air, Alchemy, Australia, Books & reviews, Central and South America, China, Earth, Fire, Japan, Metal, Performing arts, Philosophy, Spirit, USA, Visual Arts, Water, Wood, Zodiac and tagged Air, Alchemy, China, earth, Energy, Feng Shui, Fire, Japan, Metal, Music, Peru, Shinto, the elements, Water, Wind, Wood, Wu Xing. Bookmark the permalink. Incidentally, sword-making in the Japanese tradition derives its spiritual nature from the animist notion of imbuing the sword with life. It goes back to prehistoric notions of the earth being a living creature, and metal ore its gift to humans. In that sense it’s older than Shinto. It’s pretty closely related to the Arthurian tradition of Excalibur, more than just a sword but a divine entity with a spirit of its own. Thank-you so much for your comments John. You have opened up some other fascinating aspects of metal as an element. I’d be really interested in reading the book chapter you refer to. The Tibetan singing bowls are another excellent example. Your comment about the spiritual nature of the Japanese sword reminds me of a Marist priest from Australia called Tony Glynn who worked tirelessly for reconciliation with Japan after WW2. One of his acts was to try and return samurai swords to Japan that had been taken as spoils of war. He did so because he recognised the quasi-mystical symbolism and aura surrounding the swords as well as the powerful gesture that returning them would represent. For his reconciliation work, of which returning the swords was a small but significant part, he received an MBE, and AO and the Order of the Rising Sun. A great topic and continuing discussion between you and John. Metal definitely deserves its place in the list of ‘the five elements’.